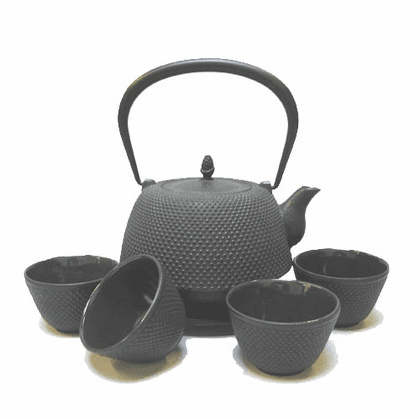 Black hobnail teapot set (one teapot, one round trivet and four tea cups). The teapot has a hobnail raised pattern around its circumference and a high black handle. The lid top has a decorative pinecone in the center. It comes with a removable stainless steel infuser basket and baked porcelain enamel on the interior. Holds 28 ounces, 5-1/2" in diameter. This teapot comes with a matching cast iron trivet which is 5-1/2" in diameter. This set also comes with four matching cast iron tea cups that are 3" in diameter. Each tea cup holds 4 ounces.